You know how sometimes, when people fall in love, they’ll say something like, “How did I get so lucky?” Well that’s how I feel about this whole experience. And it’s only the second week. I am currently a junior enrolled at Central College in Pella, Iowa and, my goodness, do I love it there. The opportunities are endless and amazing. For example, one of those amazing opportunities lead me to Chicago where I am now studying and completing an internship in the heart of this Windy City. I am a branding intern with a company called LW Branding. The LW stands for Lauren Walsh, who also happens to be my supervisor. The company represents several current and retired professional athletes and helps them in the “off-season” of the work they do. For example, I was just able to sit in on a meeting regarding a commercial gig featuring one of LW’s clients. I am learning to help strategize a lifestyle for these athletes by the best in the branding business! Like I stated, I am two weeks in and I am enjoying every second of my professional life in this city. My only setback has come from trying to navigate the Chicago Transit Authori ty (CTA). My very first day on the job, I was able to make my way to the internship site with little to no errors. After the day was finished, I left and promptly got lost as I continued to walk in the opposite direction of the train I was supposed to get on, and continued to walk that way for about 20 minutes. There was another instance where I was very late for work because of my poor planning and lack of CTA experience. On the morning of my third day of work, the train was unbelievably packed so I had to miss two runs of the 95 because I simply couldn’t fit into any of the cars. When I finally did it was because I was nearly hanging over the edge, waiting for the next train and squeezed myself in. I was practically eating this girl’s hair in front of me for two stops. Since then, I have learned to plan ahead and pay attention to directions more effectively so as to not get lost. I look forward to the art in this city as well. 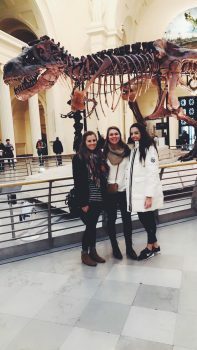 I got the chance to visit the Field Museum and it was something I can really appreciate. I love that everyone, including me, has such a unique and different appreciation for art and history. There were exhibits featuring skeletons, ancient Egypt, and the history and art behind tattoos. Spending about two hours learning about all those things made me discover a whole new appreciation for the extravagance and possibilities behind art and history. As I continue making new discoveries, I also take the time to create and reach new goals every day. My next goal is to continue to meet new and interesting people and hear their perspective on this astounding city.